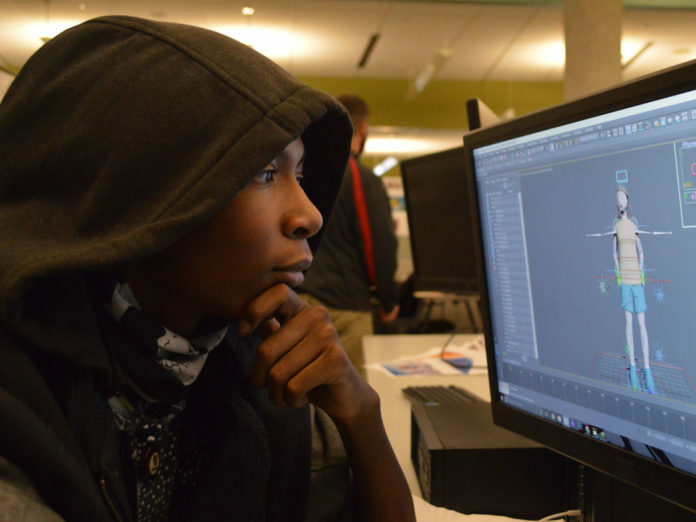 Forest Hills Eastern senior J’Lon Johnson is working on character animation Editor’s Note:Students in 3D Animation are working on a huge project to help those with autism become more successful in social situations. These efforts are drawing attention and help, both locally with an area technology company, statewide as Michigan’s winner in the Samsung Solve for Tomorrow contest, and now nationally as one of 10 finalists across the country. As a finalist, students have already won $50,000 in Samsung technology and may win even more once they pitch their project to judges in New York City. 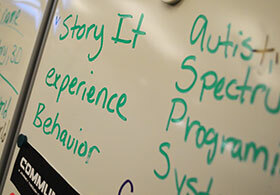 Readers can see the video about the Tech Center’s Autism Project and participate in a community choice voting campaign at the ‘Samsung Solve for Tomorrow Competition‘ website. Voting takes place right on the website, with additional votes for sharing on social media. Videos from all of the national finalists can be found on this site. Wearing a Darth Vader-like hoodie and earbuds, Forest Hills Eastern senior J’Lon Johnson, concentrated on the big picture — connecting learning to real-world outcomes. 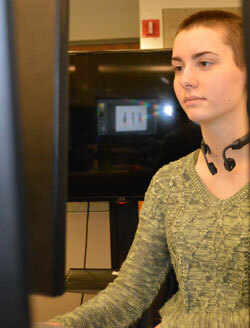 At a computer workstation, Leanne Imkamp, Sparta High School senior, is creating a series of panels for the animated storyboard for the virtual reality autism project. Each panel looks like the drawings you might find in a graphic novel. “So pretty much what I’m doing is making any movement – any poses – that the character might make because this will help the animation crew know how to pose them,” Leanne said. As they sculpt the set, props and characters, the students grapple with making everything look believable. “I need this guy to walk like a normal person,” said Mcguire VanderWall, South Christian High School senior. Mcguire, along with two other Tech Center students – Grandville High School senior Hailey Benefiel and Comstock Park High School senior Jessica Osmun, are also interning this semester at YETI CGI, a Wyoming-based design and development studio. Support from this company allows students to continue working on the project as part of their internship, after their Tech Center class ends for the day. The Autism Project grew out of a group of Kent ISD teachers seeking ideas to help their students with autism. They asked Mary Musto, a Kent ISD teacher consultant with expertise in this area, for assistance. She helped write social stories for the teachers, hoping they could be turned into visuals to show students how to appropriately handle day-to-day interactions. 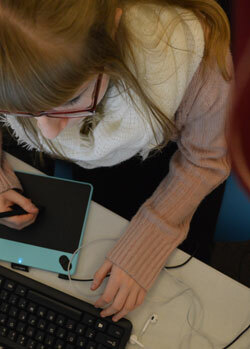 Before long, the 3D Animation students began collaborating with teachers, staff and eventually, students with autism, who are uniquely suited to help them refine the project. About 1 in 68 children has been identified with autism spectrum disorder according to 2014 estimates from the Centers for Disease Control and Prevention. “This is kids doing this for kids and that is what I really love,” Petz explained.